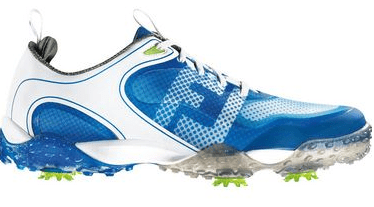 This Men’s Footjoy Freestyle Spiked Golf Shoe is on sale for $131.87 (originally $219.99), but when you add it to your cart to receive the extra 10% off clearance deal, you get it for only $118.86! You save $101.13 off the original price. The InnerSok system offers an achilles pad for additional support and comfort in the heel counter, while the Tongue-Lok™ instep grip ensures additional slip-resistant fit in a key location under the tongue. Lightweight performance mesh delivers incredible comfort, breathability and durability, while providing waterproof protection.